Happy Friday afternoon to y'all!! We still have the Nomination Ceremony to look forward to today. Andy will be putting up Jessie/Spencer, with GM being the replacement nom if need be. Andy's target this week is Jessie but he's lying to her by saying she's safe, just in case she ends up winning veto & pulling herself off the block so that he can still work with her. Andy is telling McCrae that he's putting up Spencer/Jessie but lied to Jessie and told her she's safe this week (she's the target). He told Jessie that he has a "master plan" just to keep her calm this week in case she ends up staying. McCrae thinks that Elissa is gonna gun after him (Mc) next week if she wins HOH. Andy tells them that Jessie/Spencer is going up, that he told her (Jessie) that he has a bigger plan in mind, and that she's not going anywhere, but that he does want Jessie gone. Andy: "I don't want Spencer to go anywhere this week." Helen: "So we have to make Jessie feel like she's safe this week." Andy tells Spencer he doesn't want him to go anywhere. Andy: "If you go up, there is not 1 f**king chance in hell you're going anywhere. It is best for me to go into next week with zero enemies...that's the best thing for the both us going forward. Jessie is my target & even if she wins veto, GM will go up and out. You have to trust me." Andy: "I SWEAR to GOD you are not going home!" Spencer: "If you have the votes to keep me, then.."
Andy is reassuring Spencer that either way, he's 100% safe, no matter who wins the veto. Andy: "I have the votes, no matter what, you WILL stay! OK?" They think by Andy putting him up, it'll make it look like Andy doesn't care too much about Spencer so they won't think they're working together in the game. Spencer says he trusts Andy. BB: "Houseguests, this is a lockdown. Please go outside." Spencer/Andy leave the HOH room. **Could be for the Have Not food reveal. HG's still outside. Random chatter all around. HG's still outside on lockdown. Have Nots got their food for the week: Mung beans & Mackerel (it's a type of fish). 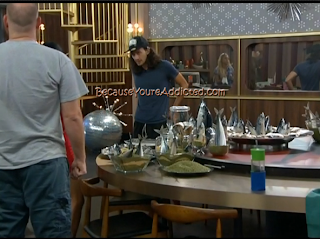 Elissa: "That's so gross, all those fish heads." Andy is telling Aaryn the plan. Andy: "I wanna blindside Jessie. I told her she's not my target. If I win the veto, I'm keeping the nominations the same. I don't want GM to go home." Andy: "If you get picked to play for veto, win it & keep the nominations the same." They're talking about Spencer: Andy trusts him, Aaryn..not so much. Aaryn: "I just don't wanna go up next to Amanda, and I have a feeling (Spencer) would put me up against her." Andy starts saying how if his plan goes accordingly, then he won't have any blood on his hands and zero people after him next week. Aaryn warns him that if GM goes up, she'll have to go home because she'll go crazy. Andy: "Are you ok with this plan?" Aaryn: "Mm hm! I do." Aaryn said that Jessie is really loyal to her now and doesn't want her to go home, but totally understands why Andy does & will do whatever he wants. Andy said to see how the week goes & if the house wants Spencer gone, then they could blindside him but he doesn't wanna do that. Aaryn: "Did you tell Helen that Jessie's going after Amanda & McCrae?" Aaryn: "Jessie's gonna have a breakdown. And if GM goes up (as a replacement nom), she's gonna freak the f**k out." Andy: "She'd be so mad at me!" They agree the current plan is good: Jessie/Spencer as noms, Jessie target, GM as a Plan B.
Elissa/Amanda/McCrae are talking on the BY couch. They're talking about how "Judd was MVP". Amanda says even if Jessie is against GM, that Jessie "has to go" this week, no matter what. Andy said they'll talk after the veto comp tomorrow but the plan is Spencer/Jessie, with GM as a replacement nom. Helen told me that she wnated me here longer than McCrae and now McCrae is scared that he'll go out soon. He deserves to be here more than I do." Andy: "I think you've played brilliantly so far in this game." Amanda said that McCrae wants to be there so bad and this "is his life". (re: BB) Amanda also said that Judd told her to "get Jessie out" when he was leaving the house last night. They agree to talk more after the veto & both hope that Jessie doesn't win it. Andy said they should keep lying to Jessie and make her feel safe all week. Same story: Jessie/Spencer as noms. Jessie as target. Hope she doesn't win veto. GM would be replacement nom. Andy wants to make zero enemies this week. GM/Aaryn have been making up a dance routine & practicing. Is it possible that they would send everyone outside to set up a Pandora's box? Maybe they are fixing to show zingbot! What would zingbot say to GM??? Mung beans and mackerel has to be the worst have not menu ever. Healthy but for a whole week? Honestly WHY do they bother trying to win HOH?? If your too scared to play the game and too afraid of the responsibilities that come with being HOH then DONT WIN HOH. The longer this season runs the more I feel like the HG's are a joke. I dont know how many times Andy has basically said he doesnt want to get "blood" on his hands... If you had thrown the comp, you wouldnt have to be the one to nominate the house guests. Blood free hands. Oh boy.... Geez. I guess I'm done complaining now. Haha! Its just driving me crazy. Andy is smart not to tell Amanda about Helen wanting him to put up Amanda and McCrae. Not sure how much if anything you can read into that. Even if he's still more loyal to Amanda and McCrae he had to have learned from several experiences that Amanda wouldn't be able to just put that info in her back pocket. She'd turn it into WW3 with Andy stuck in the middle and his "no blood" HOH would be off the rails. I think his strategy is to keep the 2 power duos in the game and just stay smack dab in the middle of them for as long as possible. Andy is a scerrdy cat. The thing with Andy is that he has literally nothing to be scared about right now so there's absolutely no reason for him to make a big move. I'm shocked he even wanted to win HOH but I guess he figured it was a good time to put a comp win on his resume while he could still do something innocuous like get out Jessie or GM. I mean he's in a great spot right now and I find it hard to find many scenarios where he's not in that house till finale night. This must be a dumb question bcuz I've asked it twice + no one has replied...but I'm gonna try again :) Where do I have to go to read the Hg's blogs? OK i wanted to post in the comments before it filled up A LOT! my take on this season: terrible! 1. nobody wants "to upset the house"
why not??? everyone wants to coast to the final 6 or 4 or 2 without having to work extra hard! 2.everyone (especially helen) keeps saying "it's not the right time to make a big move" ....WELL....when is it the right time? why would you keep people in the house,then backstab them and piss them off while they go to jury?? why not get amanda,mcrae and such out when it's smacking you right in the face??!!! 3. i cannot for the life of me understand (especially last night double evict)UNANIMOUSLY voting your "friend/s" out then crying a river for them!!! if you wanted them to stay vote to keep them in! 4. calling arryn ...janelle.... PREPOSTEROUS!! and i never even watched the season she was on!!! i am positive janelle used her HOH to get strong players out AND made those decisions on her own ....UNLIKE arryn who basically gave 2 HOH's away to whoever could plant an idea in her head! also giving up her HOH noms for safety. LAST NIGHT taking down jessie was the perfect spot to put up amanda and get her out. andy,mcrae,amanda haven't done anything to warrant staying in the house this long! Maybe The Entire Season Will Be No Game Play? Read the HOH blogs at Cbs.com. I believe it is on the official BB website. It should be under one of the drop down menus. Hope that points you in the right direction. BB Bopper, I think Jaime puts links on her blog here to see what HG's blogged. This is the only Big Brother info site I will ever come to because its so thorough so can't tell you if there are HG blog links somewhere else. If Jamie doesn't have them, I don't read them. LOL! CBS.com then find where they have the big brother stuff and you'll see it. Or if you don't want to navigate, like me when I don't want to find the live feeds, I just google search cbs big brother live feeds. So try cbs big brother hoh blog. U can see them on the CBS website. Can u tell me what "smh" is? I see other people use it and I have no clue. Consider the source, Helen comparing Aaryn to Janelle. Helen loves to hear herself talk! She is always telling people what they want to hear. It's been sickening lately and that analogy Aa to Janelle was like you say PREPOSTEROUS! I agree with anthony m! This season is sooo frustrating! I've never seen a bigger group of spineless HG's! At the end of each episode I find myself asking why I wasted another hour? I LOVE Big Brother, but this season is terrible. If I have to see Helen give another insincere hug, I'm going to puke! It is so annoying!! The only thing worth watching is to see if conceited Amanda blows up at any one else. Please bring back the game play!!! I know low IQ makes for funny sound blurbs, but higher intelligence keeps us on our toes! There is nothing surprising week to week this season. "SMH!"